It’s no surprise that Sam Burke’s mum was a great cook, and unlike a lot of people, Sam likes pressure. Is it the adrenaline? The chance to show his stuff? Or just him? 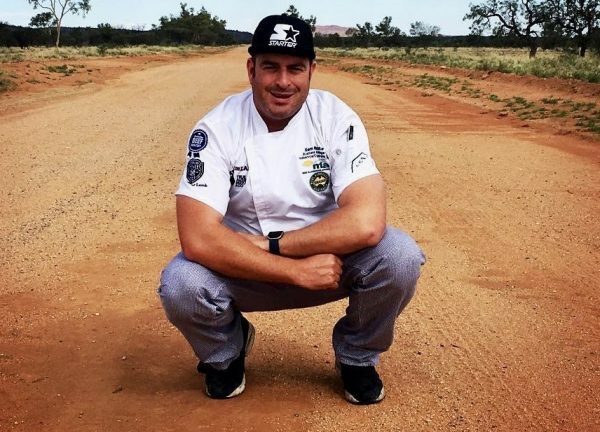 Sam Burke, meat man, is a big man with a huge heart to match, and has some great advice for others in the industry, and those wanting to step up. Where did your journey with food begin? “I’m a big lad, north of 100kgs. I love to eat – mum was a really good cook and I only wanted to do 2 things when I left school – I wasn’t bright academically – for me it was either a chef or mechanic. I loved food, and cooking with the experience of giving pleasure to people was something that held my interest. What kept you going as a young kid? “I found out I loved working in a high pressure environment – first delivering milk bottles and then spending 3 years working part time in a restaurant chain. 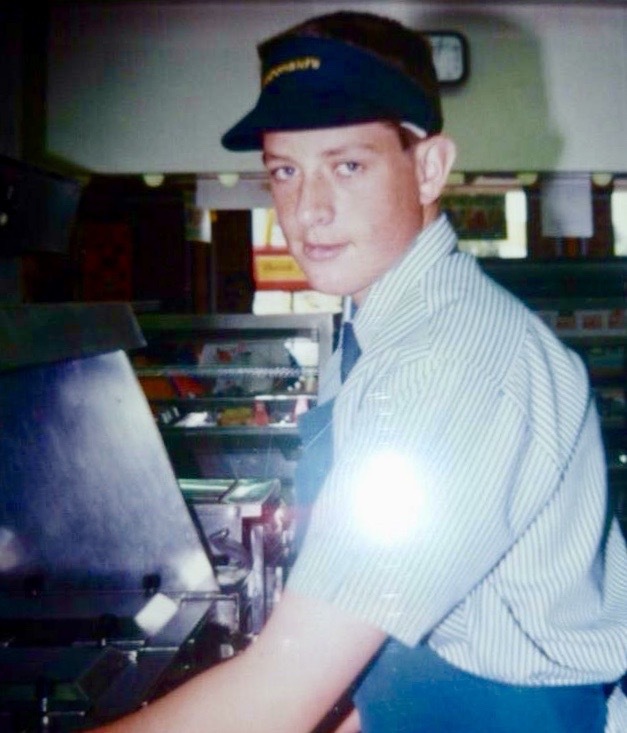 I was a hard worker, and a people person so had a great self-belief and pushed on, starting my apprenticeship in 1994. It wasFranklin’s Big Fresh in butchery as a meat attendant (years 11 and 12) that gave me a fantastic grounding. The job entailed working in all sorts of areas including serving, making mince, cleaning, and then boning – I made sure I learnt how to bone a leg of lamb. I worked for 7 years every weekend in the butcher’s shop – it was 1993-2000, and turned up for work religiously Thursday nights and Saturday and Sunday. Spotless is a huge organization. What was key there? “Working for a big contract caterer, we got a taste of everything with rotational placements every 6 months. It was fabulous training. I started at Caltex Kurnell cooking for 1,000 oil refinery workers every day. Boy they could eat. The menu was fairly limited, and nothing too fancy, based around comfort food: steak, curries, stews, it was very male dominated. Next at Commonwealth Bank in Martin Place the restaurant called Denison’s sat 50 for full a la carte fine dining. That was a huge step up. We cooked everything from scratch – it was a true old-fashioned a la carte kitchen. At the end of day when service was done, chef used to drag me into the office to do all the paper work – ordering, stock control, rosters, whatever had to be done – which I hated then, but that was a real turning point. That early training was what turned me into a business unit operator in the making. Mind you, I was still just a second year apprentice, so then they moved me on to the Taronga Centre (Zoo) in functions. It had an award winning reception centre, so that taught me large scale catering, and to be agile, then it was back to finish my culinary apprenticeship at the Commonwealth Bank, after a brief stint at IBM where I met my wife who was a young chef there. The thing that attracted me? I think it was the amazing food she did, coming from a Middle Eastern background, and we both loved the industry completely. Your training was a huge part of your passion. How? The work at Franklin’s set me up with a knowledge of meat and the entire butchering process. I don’t call myself a butcher but I respect like hell what they do. In those days, butchery was one of the biggest modules in our training program, and went for 11 weeks. When I finished at the end of 1997, I was awarded a head chef’s role, straight out of my apprenticeship. That was almost unheard of, but I knew the business side, so Spotless promoted me to a major function centre at George’s Heights for the army, for the officers. But you know what? I was out of my depth, straight out of apprenticeship, so rather than slog away and fail miserably; I put my hand up, said I was out of my depth and needed to step back. Smartest thing I’ve ever done. I think the company appreciated that, so they put me in a sous chef role at the Commonwealth Bank for Callaghan College, a training hotel where they trained all the bankers at St. Ives. That was one of the best places I ever worked at. I was so lucky, and came in under a great chef, John Knight, who took me under his wing, developing my culinary skills and focusing on my business skills as a branch manager. I was always budding to learn more, so I worked on the weekends at Signatures Restaurantat Brighton le Sands from time to time, still keeping up my butchery job, then chef de partie on the weekend at nights at Stadium Australia (Now ANZ Stadium). How did you keep your motivation, even through the hard times? I’ve found that even if you’re not married, strong family and friends are the key to a successful career in hospitality. And being humble and nice to people and listening to them while they’re speaking. Catherine Mitchell who worked for Spotless, saw something in me at a young age, she was the general manager of business and industry, the catering division of Spotless. She gave me the opportunity to run my first branch after I got out of Callaghan, so in 2000 I went to Glaxo Smith Klein, a huge pharmaceutical company then back to Callaghan as site manager after 1 year. I was fast tracked and given a lot of opportunity, because I was a hard worker, was happy to give anything a go, put my hand up if I was in trouble, and learned always from my mistakes. I worked for some very hard chefs – you always have to work with a few pelicans, they’ll fly off, but you get an inkling of someone who’s serious and deserves input. Spotless obviously saw your potential. How did you manage that? Spotless saw the opportunity to give me a portfolio as operations manager, with 12 sites to manage. That was when I took off the whites, had a briefcase with a calculator and a couple of pens, company car, and young baby in 2004. I was 29 and thought I’d reached the pinnacle of my career – that was it! I really thought I couldn’t get any higher. That big role came with huge responsibility and developed my career in all aspects of business – there was real ownership of those businesses, you got a bollicking if you stuffed up and you had to figure out if there were issues, if the figures weren’t right, you were it. It was hard, but I would take a deep breath, work it all out, and became the best people manager I could. I made a point of remembering details about the staff and treated them with kindness and respect – I knew their dog’s names, their kids, their interests, and always greeted them and said goodbye personally. Catherine Mitchell, in 2006, then headed a food development team that was responsible for business. So I went back into food from operations, overseeing business, culinary development, promotional activity, dealing with big service companies as food development manager with the great Glenn Flood. We split the country down the middle, and became best mates. We worked together for a couple of years and had a wonderful team. How did you pass on the lessons and wisdom down to apprentices under you? Glenn and I ran masterclasses quarterly to develop staff, called it “Chefs in the Making” – for our culinary apprentices, and helped new business mobilisations. Through that role, I met so many great friends, Mark Baylis, Adam Moore and so many other great chefs. I could have stayed with Spotlessfor the rest of my career, but when it came to 20 years, I got the gold Longines watch for long service in 2013, handed back my car, shook everyone’s hand, and entered the brave new world of trade marketing. What made you so passionate about your current role? 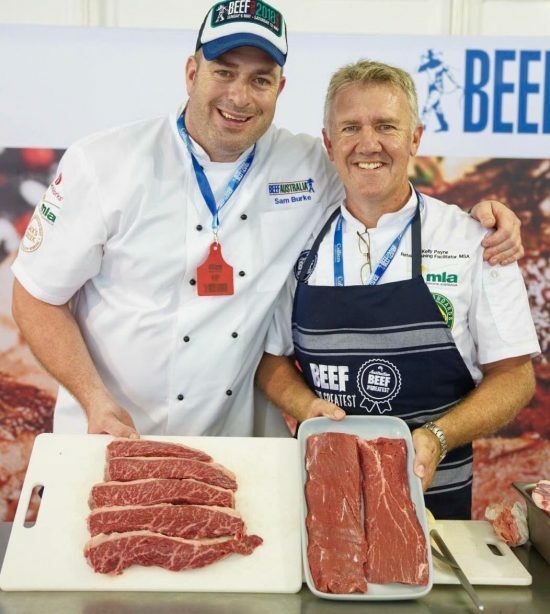 Lachlan Bowtell gave me the job at Meat and Livestock Australia, he was the marketing manager and very well respected in industry, I became the corporate chef in a new role in the trade marketing team. The role was brand new, so I wanted to create a measure, we had to be very transparent. As a not for profit, we work for the producers – the farmers who produce Australian beef, lamb, veal and goat. I made the role my own and pulled on board well respected chefs, counting on all those networks, developing opportunities to help them with their struggle with putting meat on the menu. We held master classes, with chefs and procurement managers, started developing limited time offers, point of sale promotions, glossy posters, spectacular imagery, to gain traction across foodservice. We work together collaboratively as a team to develop new dishes that meet their cost of goods, so that it’s easy and that gives the chef competence in what they’re doing. I don’twant to stress them out and I’m always so aware that the cuts have to be within their costs percentages– so we’ve put a lot of effort into developing dishes using cheaper cuts, what we call Masterpieces. I had an understanding of their pressures – with labor, affordability, market needs and service. My role is to give Australian food service the confidence to deliver great dishes in their establishments that promote whole carcass utilisation that is affordable, and comfortable for chefs to cook. The beauty of Spotlessand my work in the butcher’s shop built a strong foundation for me to understand people’s challenges in food service and help them out. What are some highlights in your new role now? 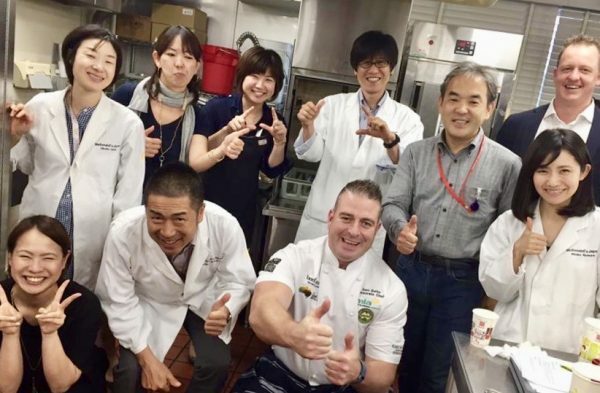 Meat and Livestock Australia has allowed me to travel the world, and in Japan I worked with the corporate office in McDonald’sdeveloping their burgers and creating new menu items. What a highlight of my business career,but I never forget where I came from and I love working for producers, working across the whole supply chain globally as well as locally. I’m always super aware that I’m working for humble people on the land, who work hard, and need to know we’re doing the right thing with their produce. I look toincrease gate returns at the farm gate, and want to do them proud. This role has been amazing. With three beautiful daughters and an incredible wife, I want to thank all the people in my career who’ve helped me, and I love to give back. 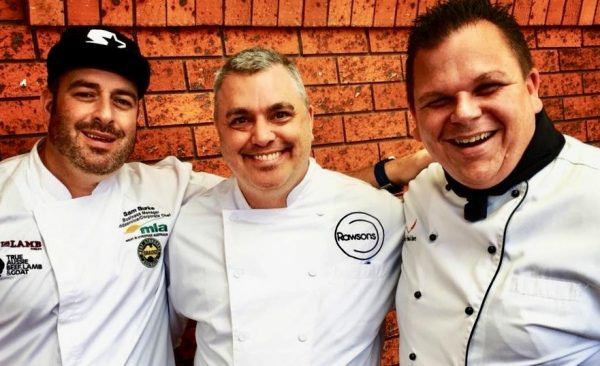 I’ve judged culinary competitions for young chefs, sat on industry boards for TAFE NSW and their“Appetite for Excellence” program and managed the culinary apprenticeship program for Spotlessfor 3 years. You need to give people the opportunity you were given yourself. That’s how I fly. What’s your advice for the young kids who see the opportunities that the industry can provide? Hospitality is very pressured, with hard long hours, and it’s important that you have some sort of hobby or interest outside of your work that burns that stress, gives you an outlet and releases the pressure so you live to cook another day. I always had 4 or 5 jobs at once back in the day, and if you treat people with respect and work hard, you can really make something and have a great career. Don’t give up. 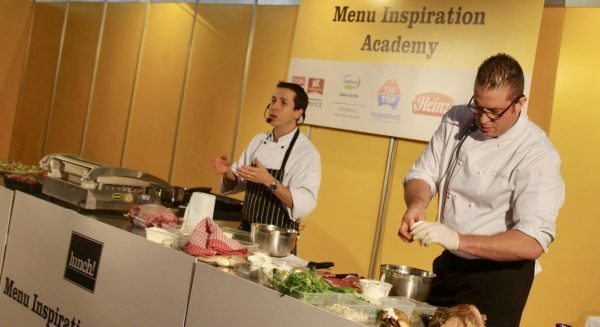 Develop your own repertoire to become the chef you can be. Be proud of your contribution, and know that you don’t have to be a head chef. It’s a huge industry, and you will find your fit. Final word? Keep pushing forward. And Sam heads off on a huge road trip, doing what he loves and does best: creating great partnerships and spreading his enthusiasm. Sam is impressive, in so many ways, and while he may be living the dream, he’s always walked his talk. What a shining example for the industry, and young kids beginning their careers.